Living in Wisconsin, we always have plenty of cheese and beer in our refrigerator. The perfect ingredients for making this delicious soup. With that being said, it certainly won’t be right of me to make this soup and not use Wisconsin cheese and Wisconsin beer. Cheddar Cheese Beer Soup is made with Wisconsin extra sharp cheddar cheese and a nice malty Wisconsin beer. Serve bowls of soup with big slices of buttered sourdough bread. Cheddar Cheese Beer Soup is made with Wisconsin extra sharp, cheddar cheese that we purchased at Sequin’s House of Cheese. Sequin’s is located on Highway 41, 45 miles north of Green Bay, WI., three miles south of the city of Marinette and about 5 miles south of the Wisconsin/Michigan border. Sequin’s is located about an hour from my house. You’re probably wondering why I would drive all that way for extra sharp, cheddar cheese? Simple, Sequin’s has the best extra sharp Wisconsin cheddar cheese. Extra sharp Wisconsin cheddar cheese is Sequin’s most popular block cheese. Their cheddar cheese is aged anywhere from 2 months to 11 fill years! In recent years, an increasing interest in Wisconsin extra sharp cheddar has come about. Extra sharp cheddar, ranging in age fro 4 to 12 years accounts for 90% of Sequin’s yearly cheddar cheese sales. As the cheddar cheese ages month by month, year by year, the moisture starts to dissipate. The salt starts to crystallize and the cheese develops a robust burst of flavor. This results in what is often referred to as “the bite,” that so many cheese lovers, love. 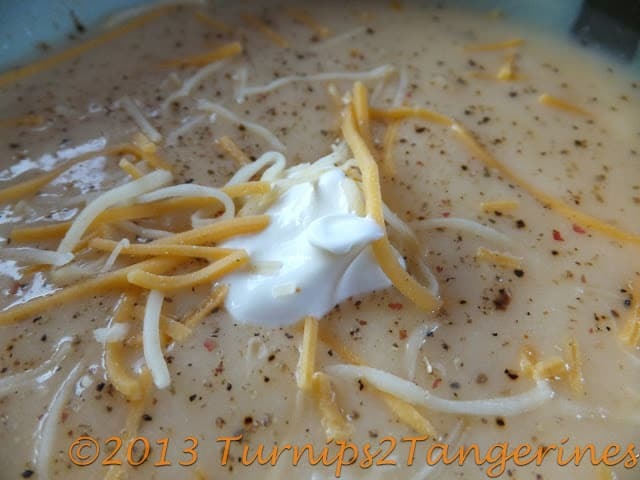 For this soup I used the 4 year extra sharp cheddar cheese, which gives this soup a super sharp yet delicious flavor. Serve this soup the same day its made for the best flavor. 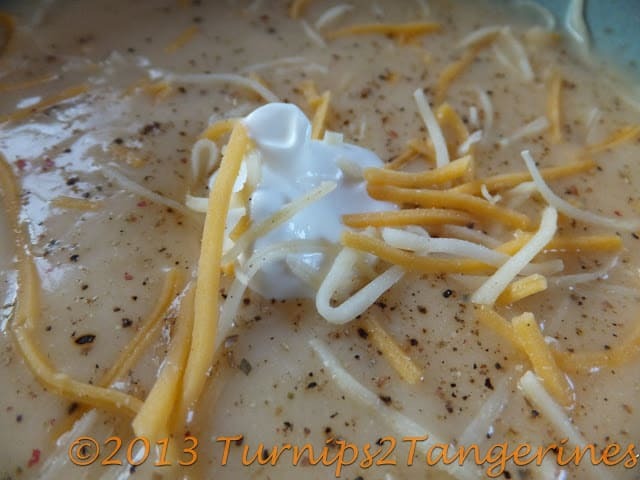 I don’t usually make soup with sharp cheddar cheese but for this soup I made an exception. It was worth it too. Sequin’s House of Cheese, Inc. was established in 1967 with a partnership between Russell Sequin Sr. and his wife, Viola, Russell Sequin Jr. and his wife Patricia and Ronald Sequin and his wife Diana. A true family owned business. The land on which Sequin’s stands today was purchased from a local physician, Dr. John Bell and a local insurance agent, Cliff Brabender, for the sum of $3500 dollars. The rest as they say, is history. Along Highway 41 through Northeastern Wisconsin, you will probably view one of Sequin’s many billboards promoting Sequin’s House of Cheese. I’m sure you’ve noticed the huge face of a Holstein cow wearing a wedge shaped piece of cheese on its head. This giant cow is uttering: Sequin’s Cheese, “Your Cheese Store with Moore.” “If Cows Could Only Talk” is their signature slogan. Make sure to add Sequin’s to your “to do” list. Sequin’s has more to offer than just cheese. Not that that’s a bad thing! Sequin’s offers lots and lots of samples of cheese, smoked sausage, and dips plus so much more. They carry Minnetonka moccasins, Wisconsin memorabilia including cheese head gear, maple syrup and Wisconsin wine. Sequin’s also sells many items made in the neighboring state of Michigan. Sequin’s sells ice cream cones too, perfect on a hot summer day. For this recipe we used a Leinenkugel’s Creamy Dark Beer. Why did we use Leinenkugel’s Creamy Dark? It’s a hearty, full bodied beer that I felt would be able to stand up to the extra sharp cheddar cheese used in this soup. And boy was I right! This soup turned out fantastic. The only thing I would change, I didn’t have enough bread to serve with this soup! Enjoy bowls of soup with bottles of Leinie’s, plenty of country bread and Wisconsin butter. 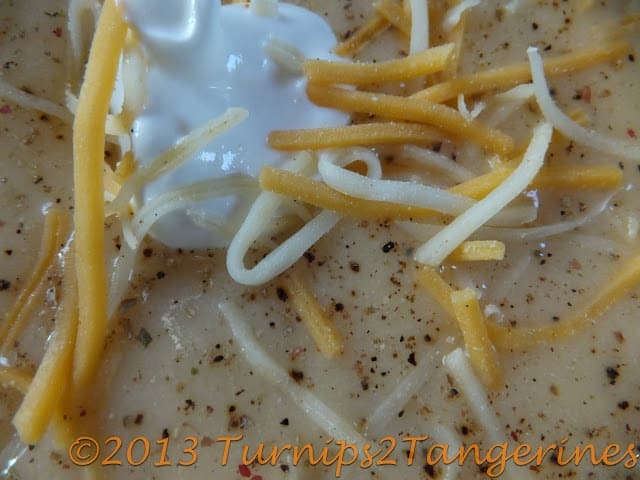 A delicious soup made with Wisconsin cheese and beer. shredded cheese sour cream, fresh pepper and crispy bacon. Melt butter in a large saucepan. Add onion, green pepper and carrot. Cook and stir over medium high heat until vegetables are tender. Stir in flour, cook 1 minute. Add stock, beer and mustard. Cover and simmer 30 minutes. Add warmed half & half or milk, cheese and sour cream. Stir until cheese melts. Heat only until heated through. Garnish with shredded cheese, sour cream, fresh ground pepper and crispy bacon. This sounds good! I might try it with beer bread and have a beer themed dinner! That is definitely new to me. I LOVE soups but never ever tried with beer.